1. 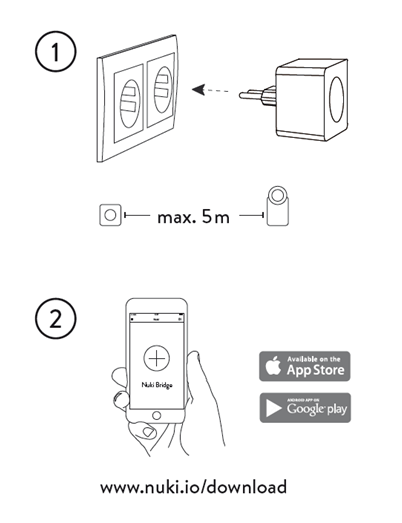 Insert the Nuki Bridge into a power socket near your Smart Lock (max. 5 meters distance). The Nuki Bridge is then automatically in maintenance mode and ready to be set up with the Nuki app. 2. Open the menu in the Nuki app (top left) and choose “Manage Bridge” to search for your Bridge in maintenance mode. During the Bridge setup you can configure the settings of your Wi-Fi and the developer mode (API). Note: To use the API you have to enable the developer mode.